As a student of tourism and intern at a tourism company in Brazil, I already traveled through some countries of America do Sul and Europe, and have some experience with travel packages. My work is to help people reach their goals and awakening the beast for travel and adventure that lives in every traveler. "City of Rio de Janeiro, City of Gramado and City of Curitiba." "I started to get interested in tourism when I went to college to study tourism. After 6 months I realized that besides wanting to work with tourism I want to have it as a vocation. 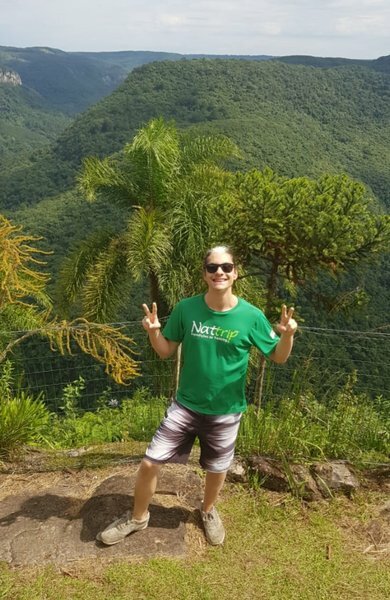 During college, I did several tours around Rio de Janeiro and some international trips." "One trip I will never forget was my first trip to Europe, when I traveled to Rome, Italy. There I was able to realize my dream of seeing the Coliseum and the Fontana di Trevi and getting to know the whole history and culture of Rome." Lace up your shoes and get ready for two days of adventure in Rio de Janeiro, enjoying the region's stunning natural beauty and mild climate to hit the trails. On your first day hike to Pedra do Telégrafo to take see views of the surrounding mountains and take the iconic daring photo with the hanging rock. On the second day hike to Pedra da Gávea, where you'll see local wildlife and panoramic views of the city and coast. Explore spectacular Fernando de Noronha, a secluded island paradise located hundreds of miles away from the nearest coast. This dreamy location is perfect for both relaxing and enjoying a tropical adventure. Go snorkeling and diving among the coral reefs, hike along the island's trails for views of turquoise waters and dramatic cliffs, or unwind on the white-sand beaches — voted the world's most beautiful.